Locked on Sundays. This piano is designed by Steven Ball. Though the G-key didn't work, there was a nice elderly man who gave me £ 5 for a coffe. Very nice project and a lovely place to play! Piano number 3 and one of the best venues of the day. A serene garden set next to the bustle of the Markets. I attempted a quick play on the way to work but it was sadly locked at 8.30am this morning. A duet with my sister. 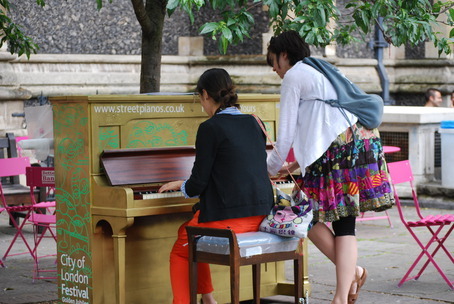 Look out for the pianos!